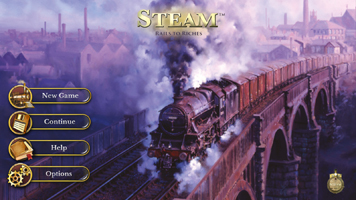 Steam: Rails to Riches is a digital adaptation of an original board game designed by Martin Wallace and published by Mayfair Games in 2009. 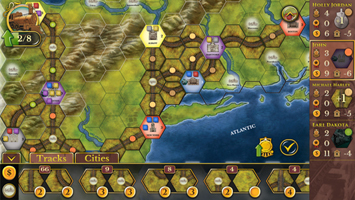 The board game was the recipient of several awards as can be seen on its boardgamegeek.com page.Steam: Rails to Riches is a game about building a rail shipping empire. While the game is themed similarly to Ticket to Ride, it has more depth than that game without being overly convoluted, and thus stands as a natural progression for players seeking a slightly more advanced railroad board game. Players must first take out loans to fund their companies and bid for play order. Then in turn players pick a "role" card for that turn that grants them a special ability for that turn as well as determining the turn order for the following turn. Players then via to manage their resources, weighing things like the cost of building track between two cities versus the amount they stand to gain by transporting the resources sitting on those cities. Unlike the aforementioned Ticket to Ride, players are free to build track virtually anywhere they desire, with various types of terrain effecting the cost of building. As the game progresses players take turns building track, upgrading their trains (thus extending the number of legs they can travel in a single turn), and transporting goods. Transported goods can be exchanged for victory points, or used to pay down the debt incurred by taking out the loans that finance the player's operations. 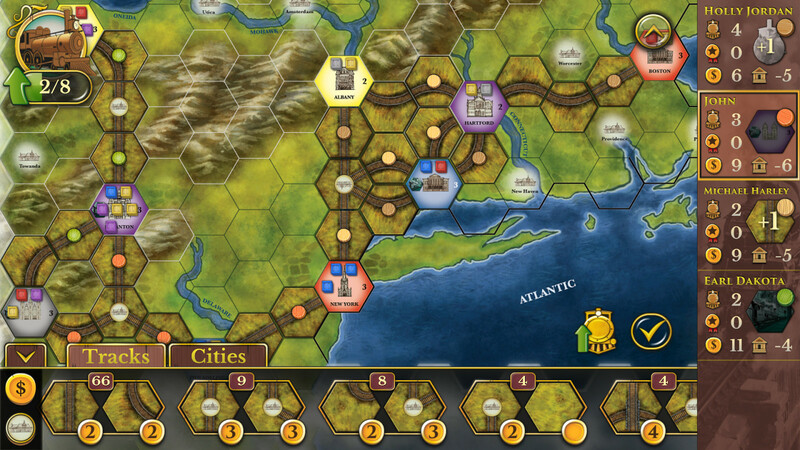 The game plays out for a set number of turns which is determined by the number of players, then victory points are tallied based on various factors to determine who has setup the most successful railroad company and won the game. The digital implementation of Steam: Rails to Riches is quite well done. The graphics emulate the art of the original board game quite nicely, while the sound effects and music compliment the theme and atmosphere of the game quite nicely. The interface if very well thought out and relays all of the necessary information in a relatively small space by using logically placed pull out drawers, making it suitable for play even on small phone screens. The game features an interactive tutorial that teaches basic game play and links to a download of the full rules from the board game in pdf format. The app currently is restricted to local play only but cross platform multiplayer is being added in a coming patch. Steam: Rails to Riches is currently available for Android, with an iOS version following close behind. In the near future the developers also plan to add versions for PC, Mac and Linux via Steam. An additional map is also currently available through an in app purchase, with further maps and expansions from the physical game planned as future IAPs. 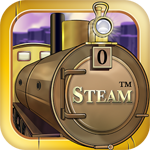 The digital board game Steam: Rails to Riches has been released for iOS on the iTunes Store, joining the previously released Android version. See the updated original post for more information about this title.